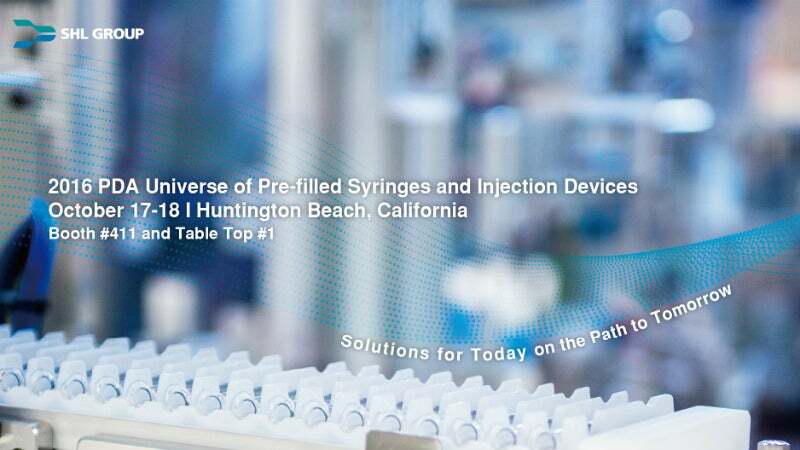 SHL will be showcasing in Booth #411 and Table Top #1 at the PDA Universe of Pre-filled Syringes & Injection Devices Event. As a forward-looking company with extensive knowledge and experience in the area of drug delivery devices, SHL delivers solutions for today on the path to tomorrow. A prime example of this is the innovative auto injector platform – Molly®. Molly® plays a central role to both SHL and its biotechnology/pharmaceutical partners with its patient-friendly design and inherent flexibility meeting the tough requirements of an innovative auto injector. In addition to Molly®, a wide range of SHL devices will be available for demonstration. SHL representatives will be happy to discuss these devices along with the other services and capabilities available through the company’s comprehensive network, including development, manufacturing, and commercialisation solutions. At the conference, Managing Director of SHL Connect Markus Bauss will provide a presentation on the topic of connectivity in drug delivery and smart administration. Here, SHL will present pioneering technological solutions, new partnerships, and joint ventures in areas of digital health, connected technology, and therapy management at the Table Top location. The conference and exhibition will take place on 17 October to 18 October at the Hyatt Regency Huntington Beach Resort and Spa in California. Visit SHL at Booth #411 and Table Top #1 to learn more about the Molly Family and other innovative auto injector devices, as well as to find out about the company’s connectivity solutions and to share ideas about the latest trends in the industry.